Why is a Salesforce partner required ? However, Salesforce products need to be tailored to your needs and business processes. Generally it is also an opportunity to review and simplify them. The partner role is to help you succeed in your Salesforce project. It is the partner who will realize the settings, configuration, developments and implementation of Salesforce products with your existing information system (Outlook, Help Desk, SAP, e-commerce site, ...). To find the right partner you need first to have a clear idea about the functional scope. Salesforce offers several products (Sales Cloud, Marketing Cloud, Einstein Analytics, ...) and offers the possibility to implement any business need (within reasonable limits 💰). It is easy to get lost in all offers by trying to put everything in place at once. The most important thing is so to define your needs. You are the client, the applicant. This step is key to the success of your project. Consulting partners can have very different areas of expertise. Several skills will be needed depending on your needs. If you want to connect your Salesforce with SAP, it is imperative that the partner have at least basic knowledge of SAP. Also, find out about previous achievements in the same functional area as yours. It is better to choose an Salesforce partner who has already completed projects in a similar or the same industry. Finally, do not underestimate the training skills and accompanying expertise to change! Also, ask the Salesforce partner if he works with offshore development companies, or if he uses external experts. Finally, meet and discuss with the project manager who will work with you to understand his way of working and judge his communication skills. Consulting partners are segmented by Salesforce into 5 categories based on several criteria: number of certifications in multiple domains, growth revenue, contract award, and so on. 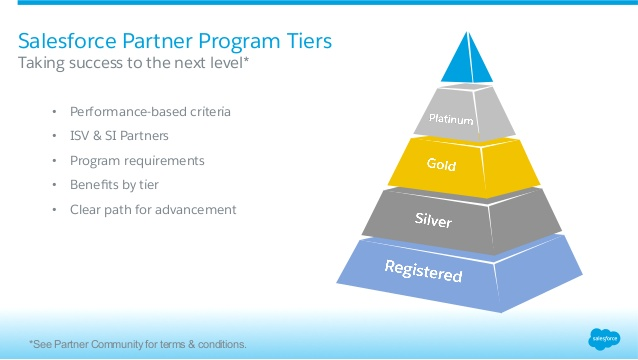 Note that to be a consulting partner, Salesforce requires at least two certifications. In the case of an international deployment of Salesforce solution, the partner will have to animate workshops with the business as well as trainings and assist the local IT team. Fluency in English is essential. Some Salesforce partners have a global presence, so they can help and provide support locally. For a deployment in China, for example, the language barrier and the cultural difference require having a local team that can intervene. Take time to visit the partner’s website, you could find the achievements, the testimonials of the customers as well as its expertise (Pardot, Heroku, ...). Finally you can get indication of the consulting partner's interest in the user experience. Do you really want to work with a partner who has a site that is not up to date or incompatible with mobile device ??? In most cases, the partner firm who performs the Salesforce implementation supports maintenance. From the start, you need to know if this partner has enough resources to meet your need for availability and responsiveness (SLA). The transfer of competences to another partner will be time consuming, not to mention the loss of functional and technical knowledge. The price should only be used as a last resort to choose your partner. It is important for you to think first about the previous criteria to select a partner sample appropriate to your needs. Also, do not skimp on quality by restricting your budget. The implementation of Salesforce is an important investment, it must be looked over time.